← Happy Birthday Gustave Caillebotte! From Synchronized Swimming to Step Afrika! Last August Director Dorothy Kosinski agreed to judge the Washington Project for the Arts‘s second synchronized swimming competition at the Capitol Skyline Hotel. Little did she know she was about to meet C. Brian Williams, fellow judge and founder and executive director of Step Afrika! The conversations started poolside on that sunny day came to a culmination last Thursday night during the museum’s Phillips after 5. As Brian has shared here, Step Afrika! and the Phillips collaborated to create a dazzling marriage of the performing and visual arts. In June, Step Afrika! premiered The Migration: Reflections on Jacob Lawrence inspired by Jacob Lawrence‘s The Migration Series in their Home Performance Series. 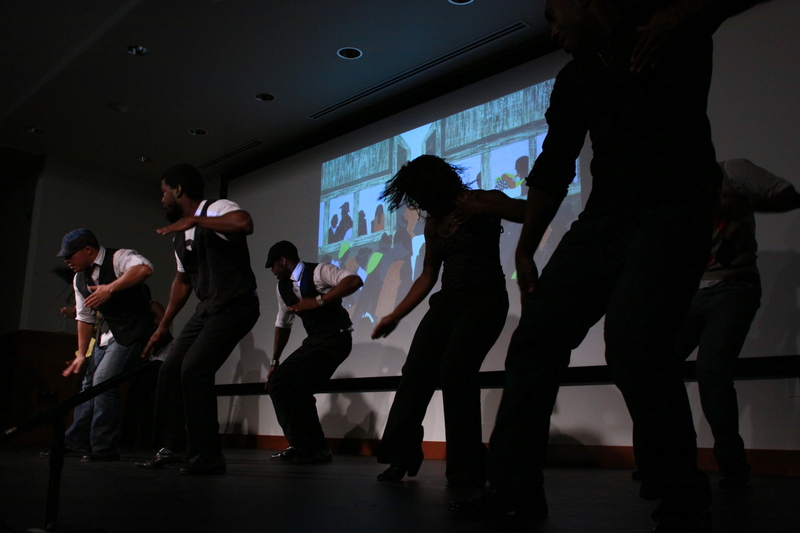 Last night, the dance troupe performed excerpts from the show at Phillips after 5. Brian told me it was Step Afrika!’s first presentation in an American art museum, and I’m so pleased it happened at the Phillips. The stage come to life from the percussive energy of the dancers, and they awed the crowd! The audience clapped and sang along with the dancers; they gave the performance a standing ovation–something I’ve never seen happen in our auditorium. I’m looking forward to seeing our stage come alive again when we collaborate with the Washington Ballet for programs related to our upcoming Degas exhibition! This entry was posted in Experiment Station and tagged collaboration, dance, Jacob Lawrence, migration, permanent collection, Phillips after 5, Step Afrika!. Bookmark the permalink.